Why is Justin Lin still obsessed with 8% growth? Justin Yifu Lin, the former chief economist of the World Bank, has a piece out on Project Syndicate giving a fairly rosy outlook for China’s future growth. Basically, he thinks China can still grow at 8%, but the government is going to be prudent and conservative and set its growth targets a bit lower. This should be no surprise to anyone who has been paying attention to his public statements over the years: ten years ago he thought China had very high growth potential, and he still thinks that today. Now Justin is perhaps the best-known Chinese economist in the world, and I am not, but I found his piece troubling in a couple of respects. It’s odd that he expresses so much certainty about a topic–future growth rates–about which there really is not a lot of certainty. What is odder is that Justin seems to be even more certain about future growth than the Chinese government, which has not officially aimed for 8% growth since 2012. I think this focus on delivering a positive message about growth prospects means that his piece ends up not being a particularly good guide to the current economic debates within China, as I’ll try to explain. In 2008, China’s per capita income was just over one-fifth that of the United States. This gap is roughly equal to the gap between the US and Japan in 1951, after which Japan grew at an average annual rate of 9.2% for the next 20 years, or between the US and South Korea in 1977, after which South Korea grew at 7.6% per year for two decades. Singapore in 1967 and Taiwan in 1975 had similar gaps – followed by similar growth rates. By extension, in the 20 years after 2008, China should have a potential growth rate of roughly 8%. That is not the only plausible interpretation of the historical evidence, but it is certainly a possible one (I have previously written about research that supports a different and less optimistic interpretation.) 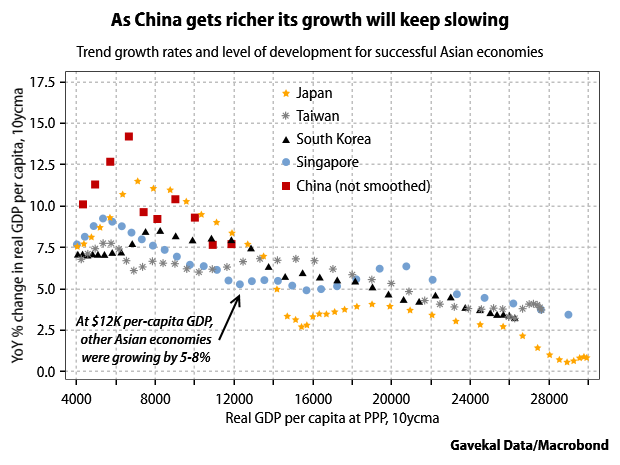 My own view is that the track record of other successfully industrializing Asian countries implies that China’s potential growth in per-capita GDP is more likely to be in the 5-7% range for the next several years (see the chart below for the visual evidence). These historical patterns are not iron laws of development, of course, but they are helpful given that there is no particularly good way of estimating a potential growth rate for a rapidly-changing economy like China’s. But the limitations of this technique are obvious, since it is based purely on comparisons of the level of per-capita income and ignores all other factors, including the possibility that China does not end up following the same development trajectory as Korea, Taiwan, etc. The point is that this historical evidence certainly not enough to rule out the possibility that China’s future potential growth is less than 8%, even before we consider all the other factors that could be at play. The US, Europe, and Japan are likely to experience continued sluggish performance, inhibiting China’s export growth. As a result, Chinese growth is likely to fall below its potential of 8% a year. As policymakers plan for the next five years, they should set China’s growth targets at 7-7.5%, adjusting them within that range as changes in the international climate dictate. In other words, he thinks potential growth based purely on domestic conditions should be 8%, but once you take into account weak global demand, potential growth is actually a bit lower. Now it is certainly true that if demand for China’s exports is weak, then China’s growth will be slower than it would be otherwise. But it’s a bit convenient that the only factor he admits that might possibly be a drag on China’s potential growth rate is the poor management of other economies. There are of course plenty of other things going on inside China that could be a drag on future growth–like the end of a decade-long housing boom that is sapping investment growth, or a high debt level that makes it more difficult to run expansionary policies in the future. Once you recognize that there are in fact big changes happening in China’s domestic economy, another explanation for why slower growth is desirable becomes much more convincing (at least to me). That is the need to encourage structural change. The current structure of China’s economy is not the structure that it will need in the future, mainly because of the end of the housing boom: all the indications are that future demand for housing, and associated goods like construction materials, will be lower in the future than it is today. So to run the economy at full capacity today would mean reinforcing the current industrial structure. But really, government policy should be trying to enable a shift toward the future industrial structure. To put it differently, to run the the economy at full capacity today, given the enormous existing capacity for building housing and supplying the needed materials, would mean stimulating an artificially high level of housing demand. Therefore to allow the economy to run somewhat below capacity is the right decision, because this does not send false signals about future demand to investors in housing and the makers of construction materials. Currently the supply capacity of traditional industries is far in excess of demand, so the industrial structure must be optimized and upgraded. … The marginal effect of overall stimulus policies is clearly decreasing. We need to deal with excess capacity, and also explore the future direction of industrial development through market mechanisms. Next Post → Can a closed internet be good industrial policy?